The Washington Post (October 24, 2015) reports that, in 1983, the Soviet Union’s paranoid political and military leaders nearly started World War III. Moscow mistakenly perceived a NATO nuclear exercise as an impending U.S. surprise attack–and almost launched a nuclear first strike. Details of this brush with Armageddon are revealed in the recently declassified report The Soviet “War Scare” (February 15, 1990) written by the blue ribbon President’s Foreign Intelligence Advisory Board (PFIAB). Now, for the first time, the PFIAB Report on the near nuclear Gotterdammerung of 1983 is available to the public, 32 years later. President Obama’s nuclear deal with Iran is not only a bad deal, but the worst deal possible–because Iran probably already has the bomb. Historically, judging from open source estimates, the time required for all other nations to develop atomic weapons is 3-12 years. Iran, which has had a nuclear program for over six decades and been crashing on the bomb for 25-30 years, should have developed atomic weapons by now. The United States during the World War II Manhattan Project (1942-1945) built the first atomic bombs, two different designs, in just 3 years. In just 3 years, when the atomic bomb was merely a theoretical possibility, the U.S. invented the two basic A-Bomb designs–the gun-type A-Bomb used on Hiroshima and the implosion-type A-Bomb used on Nagasaki–that are the basis for all atomic (fission) weapons and are the technological gateway to more sophisticated and powerful thermonuclear (fusion) weapons, including the H-Bomb. In just 3 years, the U.S. invented and built the nuclear scientific and industrial infrastructure that mass produced thousands of A-Bombs and H-Bombs after 1945 during the Cold War. Read Richard Rhodes’ The Making of the Atomic Bomb (1987) and consider whether it seems plausible that–where the U.S. invented the bomb and its nuclear weapons infrastructure in just 3 years using 1930s and 1940s era science and technology–supposedly (according to the Obama Administration) Iran has not yet duplicated the U.S. feat of World War II. Yet Iran has access to copious unclassified materials on making and designing fission and fusion weapons. Yet Iran is informed and equipped with 21st Century science and technology. And Iran has been crashing on the bomb for 8-10 times longer than the U.S. WWII Manhattan Project–for 25-30 years. Can Israel trust Vice President Joe Biden’s March 9 promise to Prime Minister Netanyahu and the people of Israel that America “will act” if Iran violates the nuclear deal? The Obama administration’s willful blindness to the present nuclear missile threats emanating almost daily from North Korea is a “teaching moment” on how President Obama–and any future Democrat administration that supports Obama’s nuclear deal–will respond to nuclear missile threats from Iran. Denial. Obfuscation. Impotence. This is how President Obama is reacting to the fact that North Korea is a fully fledged nuclear missile state. No doubt it is how President Obama, or a future President Hillary Clinton or President Bernie Sanders–who also support the Joint Comprehensive Plan Of Action (JCPOA)–will react when Iran reveals to the world that it too is a nuclear missile power. North Korea has conducted four overt nuclear tests, the last possibly of a hydrogen bomb. All of these nuclear tests are illegal violations of the Non-Proliferation Treaty, to which North Korea once subscribed in order to acquire its nuclear infrastructure. Of great significance for the case of Iran, North Korea’s nuclear tests are flagrant violations of the Agreed Framework. The Agreed Framework is not an official treaty with the U.S. but an agreement concluded with President Bill Clinton under his executive authority–exactly the same unconstitutional basis for President Obama’s nuclear deal with Iran. North Korea’s third illegal nuclear test on February 12, 2013, was followed by increased international sanctions, that prompted escalating threats from North Korea to make nuclear missile strikes against U.S. allies, South Korea and Japan, and the mainland United States. President Obama denied that North Korea could deliver on these threats, claiming that North Korea does not yet have nuclear armed missiles–despite assessments to the contrary by DIA, CIA, and NATO. 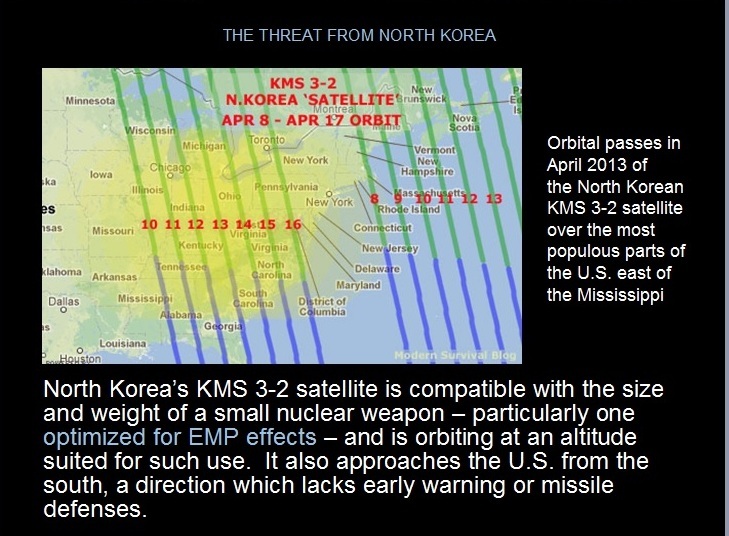 Three months earlier, on December 12, 2012, North Korea successfully orbited a satellite, the KSM-3, thereby demonstrating the capability to deliver a small nuclear warhead to intercontinental ranges–against any nation on Earth. The Congressional Commission to Assess the Threat to the United States from Electromagnetic Pulse (EMP) Attack assessed that Russia, China, and North Korea (with help from Russia) have probably developed nuclear weapons of special design that produce a low explosive yield and high gamma ray output in order to generate an extraordinarily powerful EMP field. The Russians term these “Super-EMP” weapons. Independently, South Korean military intelligence and a Chinese military commentator in open sources credit North Korea with having Super-EMP warheads. The Obama Administration, and its critics, are mistaken that Iran’s nuclear negotiations are motivated primarily by economic sanctions. Since revolutionary Iran’s seizure of the U.S. Embassy in 1979, every presidential administration has imposed on Iran new and ever more stringent economic sanctions restricting trade and seizing financial assets. Most recently, in 2010 and 2013, President Obama imposed the latest round of economic sanctions, advertised as the most stringent ever, that include prohibiting banking transactions in the rial, Iran’s currency, and even restricting importation of Iranian caviar. Mistakenly, the Obama Administration and its critics both assume that Iran’s primary reason for initiating negotiations over its nuclear program is the coercive success of economic sanctions. Much energy is being expended, uselessly, debating whether the threat of additional economic sanctions will finally compel Iran to give up its aspiration to become a nuclear weapons state. The short answer is — economic sanctions did not bring Iran to the negotiating table in the first place. If Iran Already Has The Bomb, What Then? A majority of Americans support a military strike to stop or slow Iran’s nuclear weapons program. But that assumes Iran doesn’t already have some. What if Iran already has one or more nuclear weapons and the capability to make a nuclear strike on the United States – right now? If true, this would change the calculation for the American people. Then the risks of a U.S. or Israeli military attack on Iran’s nuclear program would change radically. The truth is, no one knows for sure just how far advanced Iran’s nuclear weapons program is. There are sound reasons for doubting Washington’s official estimates that Iran does not yet have the bomb or the ability to make a nuclear strike on the United States. The U.S. Manhattan Project during World War II, working with 1940s-era technology to develop nuclear weapons that were then merely a theoretical possibility, succeeded in building two working atomic bombs of radically different designs – in just three years. Iran supposedly has been struggling to develop nuclear weapons for 20 years, with help from nuclear-armed Russia, China and North Korea. North Korea and Iran are not re-inventing the nuclear wheel. They can draw on a vast treasure trove of declassified information about U.S. nuclear weapons development. And they cooperate with one another. And we are talking EMP. The West consistently and unwittingly cooperates with North Korea and Iran by underestimating the advancement, sophistication, and strategic implications of their nuclear weapon and missile programs. Despite North Korea’s successful long-range missile test in December 2012, and now its third successful nuclear test on February 12, 2013, the Obama administration and the press keep reassuring the American people that North Korea is not yet a fully fledged nuclear weapons state – that a North Korean nuclear missile threat to the United States is still years in the future. The facts do not support this judgment. North Korea is already a major nuclear threat to the United States–an existential threat. Common wisdom in the press, encouraged by the Obama Administration and North Korea, is that North Korea has not yet miniaturized nuclear warheads for missile delivery, and that its nuclear tests are in pursuit of designing a nuclear missile warhead. Indeed, the Obama administration and the western press both naively took at face value and parroted North Korea’s public claim that their third nuclear test is for nuclear warhead miniaturization. Yet this claim is almost certainly disinformation designed to conceal that North Korea’s nuclear weapon program is advanced far beyond warhead miniaturization. Miniaturization to develop a nuclear warhead is not difficult to do, and can be accomplished even without nuclear testing. North Korea and Iran both have strategic reasons to mislead and conceal from the West the true status of their nuclear and missile programs. They intend that the U.S. and its allies will underestimate those programs, fail to act in time to stop them, and be strategically surprised when North Korea and Iran become nuclear super-powers, and progenitors of a dystopian new world order. Unfortunately, the truth is that work to protect our societies has not even begun. Those of us who have dedicated careers to protecting the American people from an EMP catastrophe know that no actual technical work is yet underway to physically protect the national power grid from EMP. We are running out of time to make this happen. As Holdren and Beddington note, the solar maximum, and increased possibility of a great geomagnetic storm, is fast approaching, now less than a year away. The press remains largely in the dark or indifferent to the EMP threat. For example, on February 15 (the same day as a worrisome solar flare that fortunately missed the Earth) a new Congressional Caucus convened for the first time–the Congressional Caucus on EMP. And the EMP Caucus rolled out a newly minted bill–the SHIELD Act (HR 668). Both the Caucus and the SHIELD Act are intended to protect the U.S. national power grid from an EMP event generated by the Sun or by hostile actors. Iran—the world’s leading sponsor of international terrorism—indicates in military doctrinal writings that the capability to make an EMP attack would enable Iran to defeat U.S. military forces and destroy the United States. Lesson From The City Of Lights: KEEP THE LIGHTS ON!! !